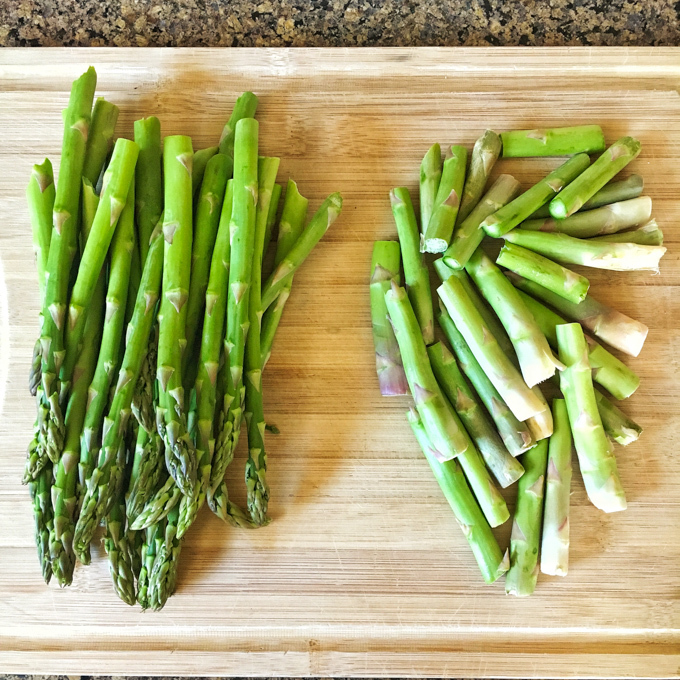 It took this month’s Recipe ReDux theme of “Easy Ways To Reduce Food Waste” to change my ways when it comes to cooking two of spring’s feature veggies: asparagus and leeks. 1) Apply gentle pressure on the end of the stalk where it will naturally break off. Demo video by dear daughter. But it took looking into one of my staple cookbooks, The Silver Spoon (<— that is an affiliate link), to realize that you certainly can eat the woody stems – especially if you are going to puree them into a soup or sauce. They just need a little more time to cook. 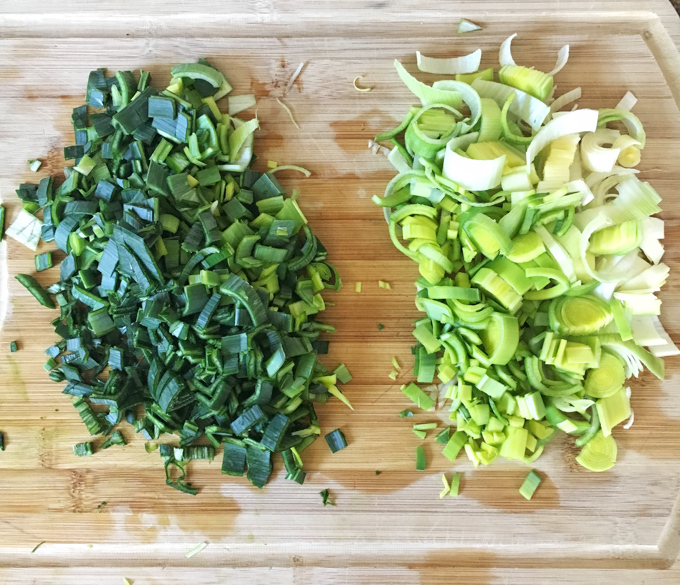 In the past, after cleaning leeks, I’d hack off the tough green ends and toss them into the compost as well – only using the white and light green section. 1) Snap off the woody ends (see video above) and then finely chop them into small pieces. Coarsely chop the remaining tender part of the asparagus, keeping piles separate. 2) Add 5 minutes of cooking time to your recipe and first cook the diced tough ends. Then add the rest of the tender asparagus and follow the recipe’s original cooking time. 3) Puree into soups, pesto and salad dressings. 1) Cut leek in half lengthwise and rinse thoroughly under water until grit and sand is removed. Chop off the dark green section and finely slice. Slice off the roots at the white end (and compost) and the slice up the remaining light green and white section, keeping piles separate. 2) Add 5 minutes of cooking time to your recipe and first cook the dark green slices. Then add the rest of the sliced leeks and follow the recipe’s original cooking time. 3) Toss over chicken or use as a pizza topping. Puree into soups, pesto and salad dressings. 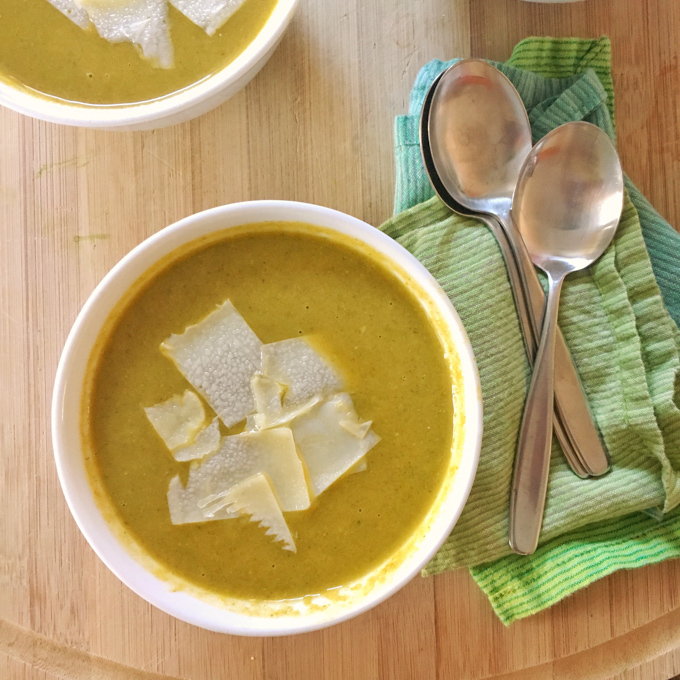 No waste recipe: use all the asparagus spears and the entire leek in this Whole Asparagus Leek Soup. Add the chopped woody stems and the chopped, dark green leeks. Cook for 10 minutes, stirring occasionally. Add in the remaining asparagus and leeks, cover with lid and cook for another 5 minutes. Mix in flour, salt, black pepper and cayenne pepper, cook for 1 minute. Pour in wine and vegetable broth, bring to a boil. Lower to medium-low and cook for 20 minutes. Turn off heat. Slowly mix in kefir or buttermilk, turn heat back to low and warm for 5 minutes. Before serving, mix in lemon zest and juice. Served with shaved cheese on top. 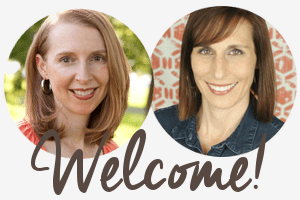 Click on the ReDux logo below to see all the cool ways our ReDux bloggers are reducing food waste and the recipes that will help you do the same in your kitchen! Yep, I am the same as you – always chucked out those end bits. Good to know they cook down nicely. All those years, I never gave it thought to even try to cook them! It was definitely an eye opener for me! I had NO clue you could cook the woody stems either! Asparagus is my favorite vegetable! I have never tried to use the stems for anything but veggie stock, this is a great idea! Thanks! Using it for stock is a great idea too! Thank you for sharing two of the veggies that I tend to pare down before using! 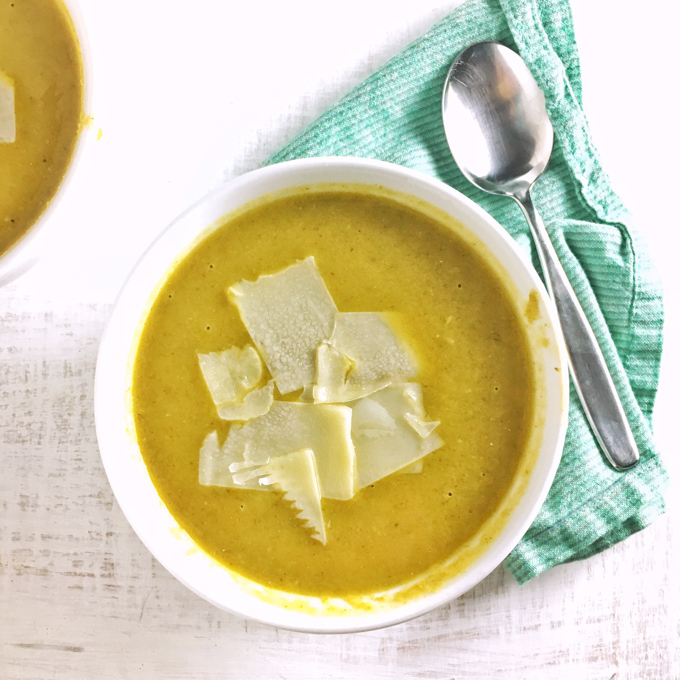 I am inspired to use the entire veggie when I make your soup! Thanks Denise – I’m trying to be better about food waste and asparagus and leeks were always 2 veggies I automatically paired down too!